This post is in partnership with Turkey Hill Ice Cream, thanks for supporting their brand along with MADE. SIMPLE! Who else is screamin' for ice cream on the daily this summer? When I want to treat myself my go to is always ice cream but not just any will do. Turkey Hill recently launched an all natural ice cream line made with ONLY 4 ingredients (cream, sugar, milk and vanilla bean) and NO artificial flavorings. Like everything I make, Turkey Hill ice cream is MADE. SIMPLE! Some people prefer their ice cream in a cone but I'm a bowl kind of gal. 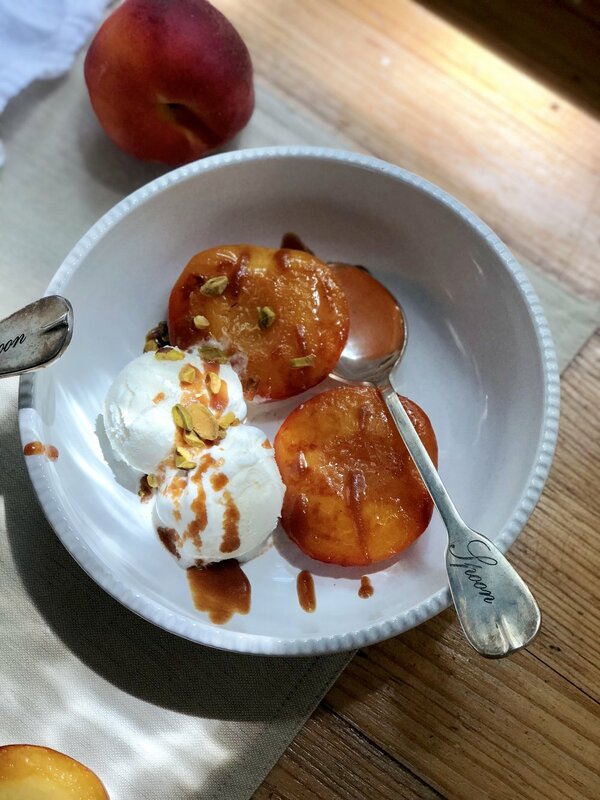 For this heavenly ice cream sundae I chose Turkey Hill's all natural vanilla bean ice cream to pair with my roasted peaches and oh my it was absolutely delicious! Roasting the peaches in olive oil enhances their flavor and pairs perfectly with the sweetness from the ice cream. To take it to the next level drizzle on some salted caramel & top it off with chopped pistachios. This flavor combo is seriously amazing. I am not a fan of desserts that are overly sweet and this has the perfect balance. A delightful treat without making you feel too guilty! Preheat your oven to 400 degrees. While the oven is pre-heating, wash and dry the peaches. Cut them in half and remove their stones. Lightly grease the bottom of a sheet pan with extra virgin olive oil and rub the peaches with olive oil as well. Place the peaches cut side down onto the sheet pan and sprinkle with raw sugar. Roast them in the oven for approximately 15 minutes, the peaches should be slightly soft to touch (not too soft) and the skin will look wrinkly. Once you remove the peaches from the oven, carefully peel off the skin. Using a spatula remove them from the sheet tray and place them on a plate to cool. For a little extra pizazz, one minute on a grill pan will provide additional color to the peaches. Combine sugar, salt, honey & water into a saucepan. Cook over low/medium heat (do not stir!) until the sugar dissolves and turns dark amber in color. Remove from heat, slowly whisk in heavy cream & butter (and bourbon if desired). Return back to medium heat & cook until the temperature reaches 235-240 degrees. Let cool and pour into a glass bowl. If you have extras, store in an air tight container for several weeks. Scoop 2 (or more) scoops of Turkey Hill vanilla bean ice cream into a bowl. Place 2 peach halves into the bowl, drizzle with salted caramel and top with chopped pistachios. Grab a spoon and dig in! Want to try Turkey Hill ice cream for yourself? You're in luck! Turkey Hill is going on a Good Mooed sampling tour in select U.S. states from the East Coast to the Midwest showing off their all natural ice cream. Oh, and did I mention there will be samples?! YUM! 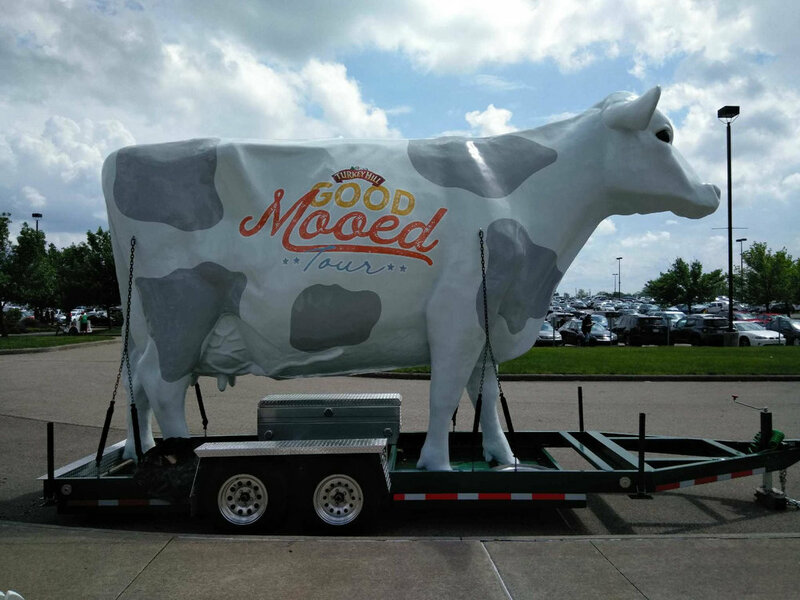 Follow this link to see if the big cow will be stopping by a town near you this summer! You can also visit this link to find Turkey Hill Ice cream at your local grocery store. There's no doubt a bowl (or cone) of their ice cream will put you in a Good Mooed!